Genghis Khan when he set out on his 12th-century world tour, had a stable full of sons to choose from for his right hand. But he chose his 4 daughters to manage his burgeoning empire instead. The khan planted his girls north, south, east, and west of his inner-mongolian stronghold surrounding himself with intelligence, allegiance, and strength on his outer perimeter. Though they could neither read nor write, for the first time in human history the girls managed to unite the silk trading route under a single leadership, added postal dispatches, hostels, security, increasing the efficiency of trade along the route heretofore never before seen in history, bringing to fruition one of the greatest empires the world has ever seen. 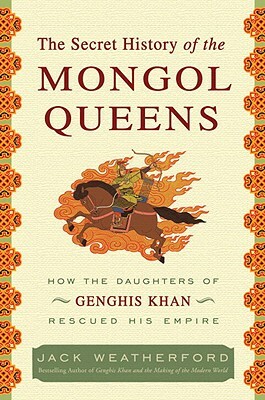 In contrast to his daughters' intelligence, upon his death Genghis Khan finally selected for supreme leadership one of his sons– his first big act was to round up 4,000 Mongolian girls beginning at the age of 7 to have them raped in front of their families by his military, ushering in the beginning of the downfall of his father's hard work. The author of The Secret History of the Mongol Queens: How the Daughter of Genghis Khan Rescued His Empire holds the DeWitt Wallace Chair of Anthropology at Macalester college here in Minnesota and holds an honorary position at Chinggis Khaan University in Mongolia. In 2006, he was awarded the Order of the Polar Star, Mongolia's highest national honor.